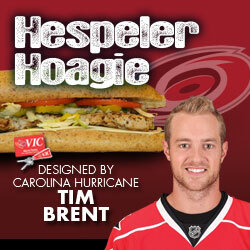 Thursday, March 8, Carolina Hurricanes forward Tim Brent will team up with Harris Teeter to debut Brent’s personally designed Signature Sub Sandwich which is guaranteed to fill even the largest appetite. Brent’s sandwich “Hespeler Hoagie” is a must-try for Harris Teeter shoppers. For only $3.99, fans can satisfy their appetite with “Hespeler Hoagie”: grilled chicken with provolone cheese on a wheat sub roll, layered with lettuce, tomato and banana peppers; topped with ranch dressing and sprinkled with salt and pepper. Shoppers make it a lunch pack for only $4.99. The lunch pack includes “Hespeler Hoagie” sandwich, your choice of Harris Teeter Sweet Tea, Unsweet Tea or Lemonade as well as your choice of one Chocolate Chunk, Macadamia Nut, Oatmeal Raisin or Cranberry Nut Cookie. “Hespeler Hoagie” will be available in the Fresh Foods Market Sandwich Shop in all Raleigh-area Harris Teeter stores. Thursday only, however, Brent will make an appearance at the Crescent Commons Harris Teeter to personally introduce shoppers and fans to his Signature Sub Sandwich. He will also be signing autographs. Harris Teeter’s Fresh Foods Market offers made-to-order sandwiches and wraps daily and is proud to introduce “Hespeler Hoagie,” Harris Teeter’s final Hurricanes Signature Sub Sandwich of the season.